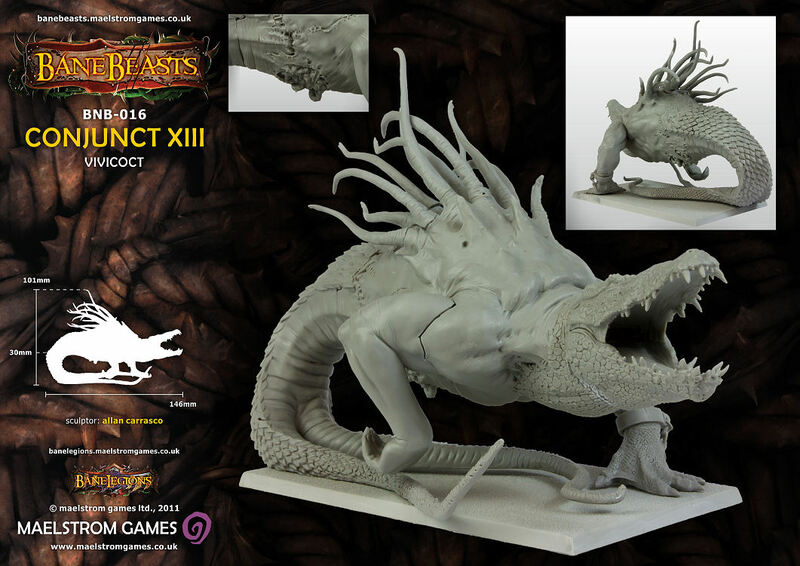 Ein neues Banebeast ist vorgestellt worden, Conjunct XIII, Vivicoct. The madness that lies within the minds of the Ysians, and in particular their physicians, can be readily seen in the bizarre form of Conjunct XIII. This grotesque vivicoct of krokodile, wyrm, jötunn and an as-yet unidentified creature has proved to be a savage, ignoble brute, capable of smashing shieldwalls apart by sheer force and destroying much larger enemies due simply to its ferocity. Such is Conjunct XIIIs reputation, despite its obvious locomotive limitations, that few levies will stand upon sighting it and most shudder at facing such an unnatural creature, a wrong-beast that simply should not exist, something that the Ysians are exploiting further with more living concoctions, more insane creatures stitched together for use in their man-starved armies. 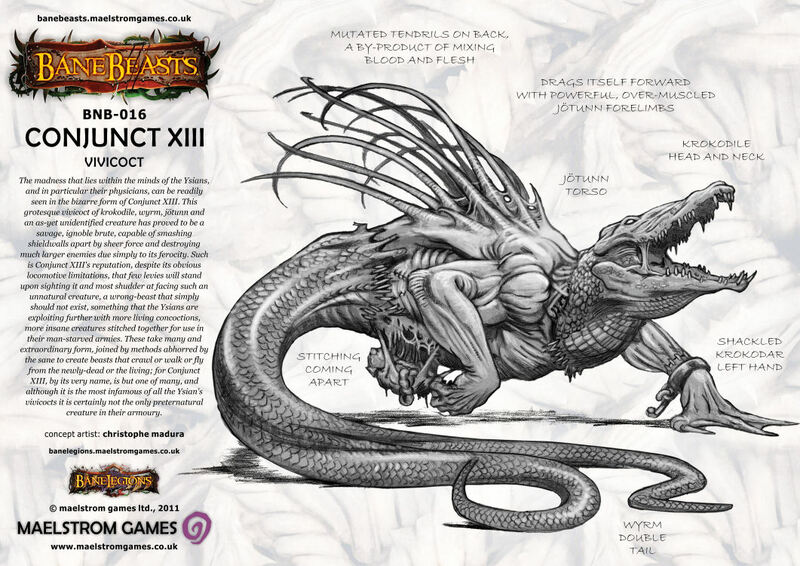 These take many and extraordinary form, joined by methods abhorred by the sane to create beasts that crawl or walk or fly from the newly-dead or the living for Conjunct XIII, by its very name, is but one of many, and although it is the most infamous of all the Ysians vivicocts it is certainly not the only preternatural creature in their armoury. Das Modell wurde von Allan Carasco modelliert und ist für 49,99 Pfund ab dem 1. Oktober erhältlich. Hm, sieht alles etwas komisch aus. Ich glaub, man könnte daraus noch einen halbwegs anständiigne Grinderlake bauen, indem man Flügel noch hinten drauf klebt. Nein, aber ich frage mich für was man das Modell einsetzen könnte. Eigentlich orientieren sich die Minis von Bane Legion doch ziemlich an der Warhammer Welt.